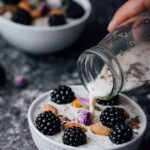 Blackberry Quinoa Breakfast Bowl is the best morning food for the times when you don’t feel like eating anything. With all the healthy foods inside, this breakfast bowl gives a magical touch to your body and makes your body ready for the day. Fill a small pot with quinoa and water and bring to a boil. Reduce the heat to the lowest and cook covered until all water is gone, about 15 to 20 minutes or until fluffy. Let it cool. Mix almond milk, cinnamon, vanilla extract and maple syrup. Share cooked quinoa in bowls and pour the milk mixture over each. No certain measurement for this, just pour as much as you like. Top with almonds, flax seeds, blackberries and dried rose buds.